I love sausage. Lovely, seasoned sausage. Meaty, spicy goodness. Lately, I don’t love the other stuff in sausage – not just the toasted wheat crumbs that so often creep in to mess with me, but the Other Stuff. This fascinating website called Wedliny Domowe shows, among other things, the usual additives in sausages and what they’re put there for. For instance, I had no idea that the purpose of phosphates in processed meats was to trap water in the meat, so that as much water as possible can be added, boosting the weight of the product by as much as 30%. AquaSausage – oh, boy, my favourite! You can see why I’m beginning to want to make as much from scratch as I can. There are some cool websites with sausage recipes: The Spicy Sausage, MeatProcessingProducts.com, We Are Not Foodies, and more. Almost all of them call for a meat grinder, a sausage stuffer, and a source of natural casings. But I’m in a hurry, and I don’t have room for any more kitchen equipment. 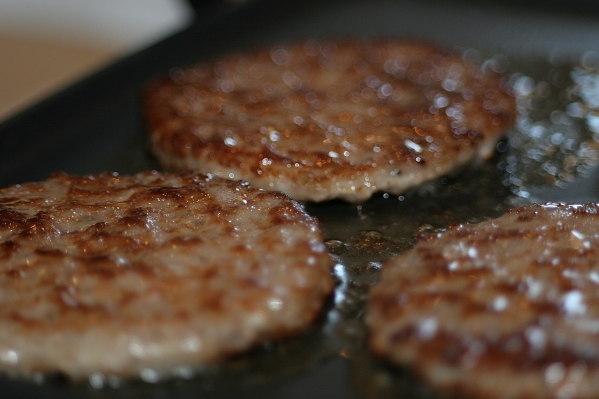 So I’ve found that, using pre-ground meats, it’s easy to produce delicious, additive-free sausage patties. All the different combinations of spices and meats can be used. And they taste all the better for the lack of preservatives, curing accelerators, flavour enhancers… and water. Here is one recipe I came up with, an easy breakfast-style sausage with a comforting flavour, very kid-friendly as well as adult-friendly. If you’ve got a meat-grinder, by all means start with chunks of pork; they’re probably fresher than buying the ground meat. But if not, just go for it. Sausage on! Grind or pound pickling spice so that it measures 2 teaspoons. Combine thoroughly with pork, water and salt. Shape into patties. Fry in pan or bake in the oven until done. Note: cooked patties freeze well, and keep for several days in the refrigerator. This entry was posted on February 19, 2013 by thinkreadcook and tagged additives, cooking, DIY, food, homemade, nutrition, patties, phosphates, pork, preservatives, processed food, recipe, sausage, sausages.